Radon is an odorless radioactive gas that is a by-product of the natural breakdown of uranium within the earth. Radon is found in soils and rock throughout North America and it can get into our homes through foundation cracks, air leaks, or well water etc. It has been implicated as a major cause of lung cancer; in fact, it is widely regarded as the second leading cause of lung cancer in the USA (and the leading cause for non-smokers). The best available technology to remove radon is activated carbon. To learn more about activated carbon, click here. While almost all of our Austin Air and Airpura air purifiers contain activated carbon filters, certain models are better suited to radon reduction. The greatest factor in radon removal effectiveness is the volume of activated carbon present in the filter and the air processing rate of the system's fan. Consideration should also be given to your budget, the size of room you wish to treat (air processing rate), the removal of other contaminants, and filter life. Please note: While using an air purifier containing activated carbon filters is an important part of a residential radon abatement program, source control and ventilation should always be regarded as the primary approach to radon control. Where source control and ventilation are insufficient to achieve safe or targeted levels, or if an extra measure of protection is desired, air filtration with activated carbon is an effective complementary abatement approach. The effectiveness of an air purifier for radon removal will depend greatly on the air processing rate, room size, and re-contamination rate. We do not advocate using an air purifier on its own for radon reduction without source control/ventilation. Regardless of the radon reduction approach or approaches used, we are also strong advocates of regular follow-up testing to ensure that your radon reduction strategies are effective and continue to be effective as time passes. The following guide produced by the U.S. EPA offers some useful information on reducing the amount of radon entering your home: Consumer's Guide to Radon Reduction. 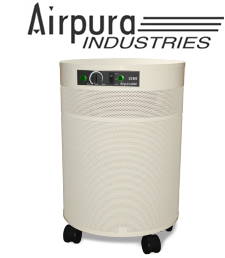 Our top choice is the Airpura C600 which features an extra-large 26 pound activated carbon filter, more than 40% more carbon than other Airpura models (except T600) and more than 70% more activated carbon than the larger Austin Air models.